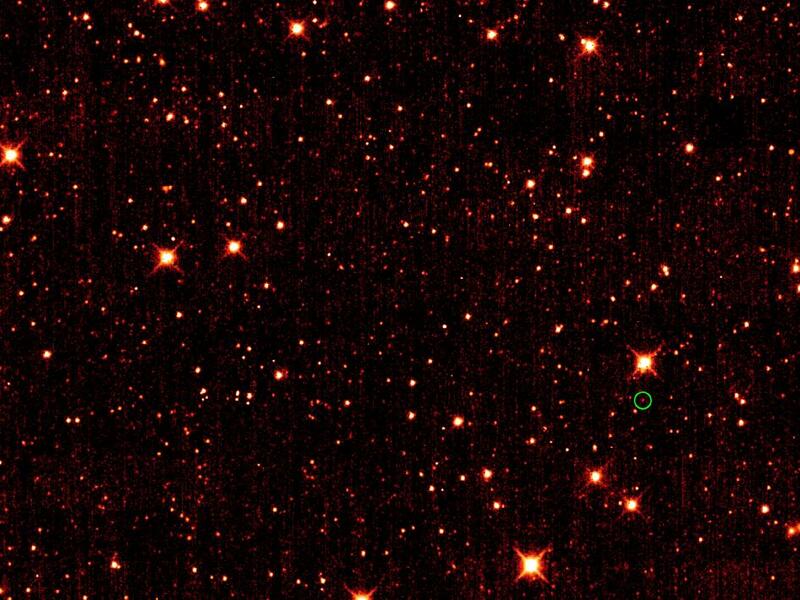 Image of 2010 TK7 (dot in center) from the Canada-France-Hawaii Telescope. Credit: C. Veillet. On July 27, 2011, scientists announced the discovery of a small asteroid that shares its orbit with Earth: 2010 TK7, a 1,000-foot-wide asteroid, precedes our planet within the same path we take around the Sun. It’s currently located about 50 million miles away in a position known as a Lagrange point (L4, to be exact) where the pull from the Earth, Sun and Moon even out to create a stable gravitational region. Objects like this – that orbit within planets’ Lagrange points – are called Trojans, after a group of them first discovered within Jupiter’s orbit. Astronomers has suspected that Earth may have Trojans of its own but hadn’t been able to confirm the existence of any until now. Their small size and proximity to the glare from the Sun makes them very difficult to locate. But NASA’s WISE infrared space telescope – which completed its Near-Earth Object mission in February – offered researchers the ability to locate such faint objects. WISE image of 2010 TK7. NASA/JPL-Caltech/UCLA. Infrared data from WISE and optical data from the Canada-France-Hawaii Telescope was used to confirm the existence of 2010 TK7. 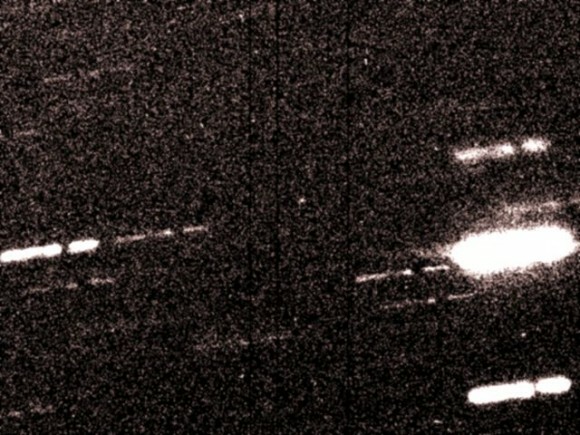 And it’s suspected Earth may have even more as-of-yet undiscovered Trojans out there. 2010 TK7 doesn’t move in a nice straight path; it travels in an unusual looping orbit that takes it high above the Earth at some times and far below at others. Although it changes position its orbit has been well defined by astronomers (for the next 100 years at least) and it will never come closer to the Earth than 15 million miles – 60 times the distance from the Earth to the Moon. Discoveries like this illustrate the importance of funding next-generation space telescopes like the upcoming James Webb Space Telescope. Without their unique viewing capabilities away from Earth’s atmosphere we wouldn’t be able to make such observations. Read more about this on Universe Today or check out the official news release. Note: and no, this doesn’t mean Earth will be “demoted” from planet status like Pluto or that it doesn’t “clear its orbit”. 2010 TK7 is in a Lagrange point that “belongs” to Earth…there are similar objects in the orbits of Jupiter, Neptune and Mars too, as well as several of their moons. Think of it as currently living in Earth’s rental property. Next Post Juno where I’ll be next week? This me think to Pythagorean.These philosophers thought that Earth had an counter-earth, a planet in the same orbit as the Earth, but 180° out of phase. AlsoIf such a planet actually existed, according to present scientific cosmology, it would be permanently hidden behind the sun but nevertheless detectable from Earth, because of its gravitational influence upon the other planets of the Solar System.